Auguste Leroux was born in Paris in 1871; he was a student of Bonnat. He won the Grand Prix de Rome in 1894. Leroux exhibited at the Salon des Artistes Français beginning in1898; he became a committee member in 1904. He won a bronze medal at l’Eposition Universalle in Paris in 1900. He was awarded Chevalier de la Légion d’Honneur. Leroux exhibited in many Parisian galleries including Galerie Allard, Galerie Petit, Galerie Charpentier, and Galerie Mona Lisa. Leroux executed designs for several public buildings including some of the images in the mosaics for the church of Sacré-Cour, the crown of Montmartre. Leroux was a very successful illustrator of books. His early works were Symbolist and Art Nouveau, with many allegorical and mythological subjects. Leroux’s later paintings show exquisite academic training, and his fascination with the female form. 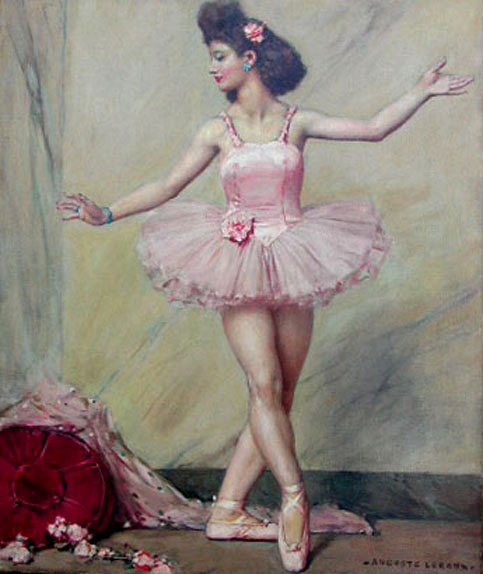 He painted many very realistic works of ballet dancers in beautiful and detailed interiors. Recently many works of Auguste Leroux have come to market because of the sale of the atelier of his family; this is also true of the works of his son André and daughter Lucienne.